As a home owner, you will be familiar with the routine maintenance that is required on an annual basis. Your home needs regular maintenance to remain in good condition. This also applies to chimneys. Chimneys form an essential part of most homes, but because they are effectively hidden from view, we very often neglect them, for longer than it is safe to do so. Your chimney may become blocked or obstructed for a number of reasons. This can affect the draught. If the chimney is not high enough, the ambient updraught may prevent the smoke traveling the way way that it should do. If your home is too airtight, this can actually result in smoke being drawn into the home leading to the risk of carbon monoxide poisoning. 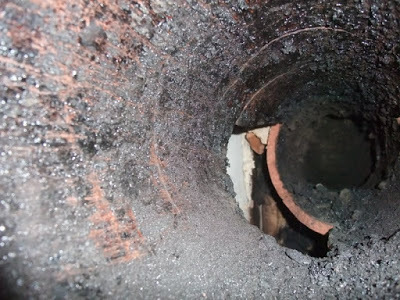 The obstruction can be cause by something as simple as a next or it could be cause by a build up of soot or a damaged pipe. If you burn turf or wood, there is a risk of a creosote build up. This is highly flammable as it is a mixture of tar and soot. Get your chimneys cleaned more often than you think you need. Chimney that are not looked after can lean, deteriorate, and in some situations, completely collapse. It is important to ensure that water does not enter the chimney system Re-pointing the mrtar, repairing damaged mortar is an important task. Sometime the actual brickwork also becomes damaged. Carrying our minor repairs on your chimney is far more cost effective that an complete chimney re-build. The heat generate inside the chimney during a Chimney fire can lead to cracked mortar, cracked or damaged chimney walls and more. It is important to carry out a complete survey. At Kilduff Construction we have the technology and ability to carry out thorough examinations of chimneys with little fuss. Our estimates are accurate and we can give these on site for all repair work.